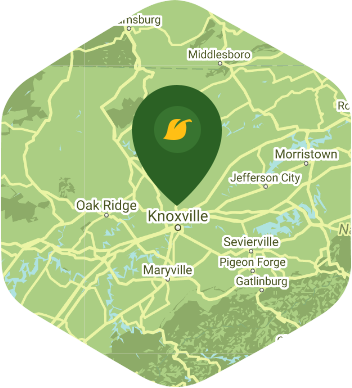 Book a skilled leaf removal expert in Knoxville. Backed by a total satisfaction guarantee and amazing customer support. What can you expect to find in Knoxville, TN? Well besides Fort Knox, the Women's Basketball Hall of Fame, and the Knoxville Symphony Orchestra and Opera you can also look forward to its annual "Christmas in the City Event" which takes place during the holiday season. There are also art galleries, museums, festivals, and theaters that will give you plenty of reasons to leave your home. Don't spend your weekends getting stuck at home trying to remove leaves from your lawn. Leaf removal is something that is best left to Lawn Love. With our professional leaf removing service you can rest easy knowing that our crew of independent lawn pros will be working hard to rake away all of those dried up leaves covering your lawn. Leaves fall from the trees every autumn and this will last for several weeks. They might look beautiful, but they can be quite a cause for concern as they can suffocate your lawn. You can easily schedule and book our lawn mowing service through our website or mobile app, and you can do so without any hassles as it can be done in minutes. You can call us at 865-219-2547 or request a quick online quote to find out more about our leaf removal service.